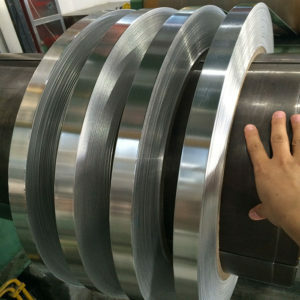 6061 aluminum strip production process, from semi-solid slurry preparation, the formation of a certain amount of alloying elements of the blank, after hot-rolled cold-rolled treatment, corner cutting and surface clarity, the formation of a specific size of the width of 6061 aluminum strip. Through the production process of strict quality control, 6061 aluminum strip castings and mechanical properties of the workpiece to the greatest degree of development. For the late mold manufacturing, the required preheating temperature of 400-425 degrees, produced by the product structure is dense, fine grain, than the ordinary steel tensile properties and processing performance is much better. 6061 aluminum strip materials are popular, not only because of its high strength, good corrosion resistance, but also with the current environmental protection.